During this month’s Computex 2014 technology show the development team behind the Leap Motion gesture control technology has unveiled their new stand-alone HP Leap Motion Keyboard which will soon be available to purchase for $99. The HP Leap Motion Keyboard will enable PC owners to add gesture controlled Leap Motion technology to an existing PC system with ease, providing users with an immersive software and app control experience. Watch the video after the jump to learn more. The Leap Motion gesture control technology provides a similar gesture control method for application control, as provided by Microsoft’s Xbox Kinect. However the Leap Motion technology is able to track finger movements of “up to 1/100th of a millimeter” and even recognise individual digits providing much more accuracy than the Kinect system. The new Leap Motion technology is also available in both the recently launched HP Envy 17 laptop as well as using one-off Leap Motions gesture control dongle is which are available to purchase for around $75. 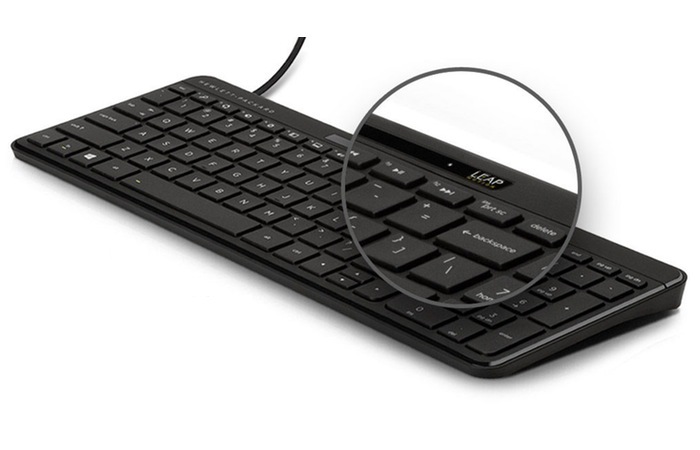 The HP Leap Motion Keyboard supports any PC system running Microsoft’s Windows 7 or their latest Windows 8.1 operating system. The Leap Motion development team has also created a dedicated application store called Airspace which features software and applications that support its Leap Motion gesture control technology, making it easy to find supported apps for your needs.